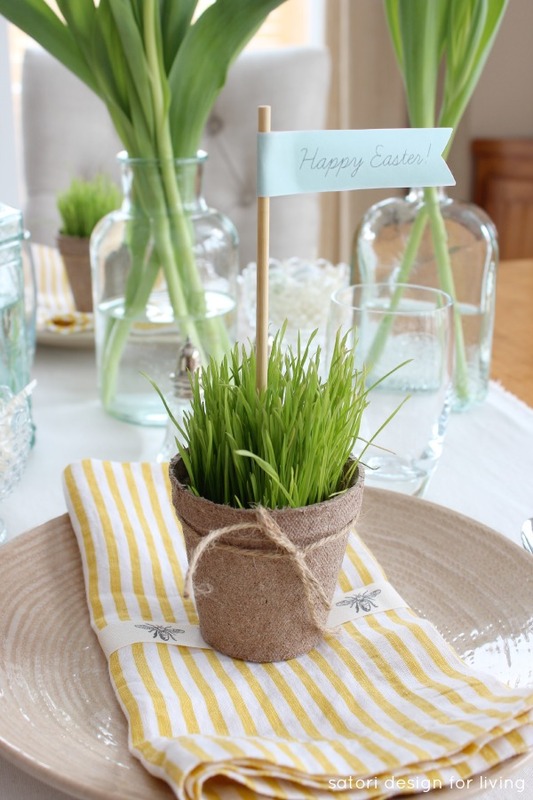 Create a nature-inspired Easter tablescape with wheatgrass peat pots, beautiful tulip arrangements and more Easter decorations! Easter is just around the corner, and I thought it would be fun to create a new tablescape for our family gathering. After this long harsh winter, nothing makes me happier than seeing the freshness and vibrancy of green mixed with natural elements of Spring. 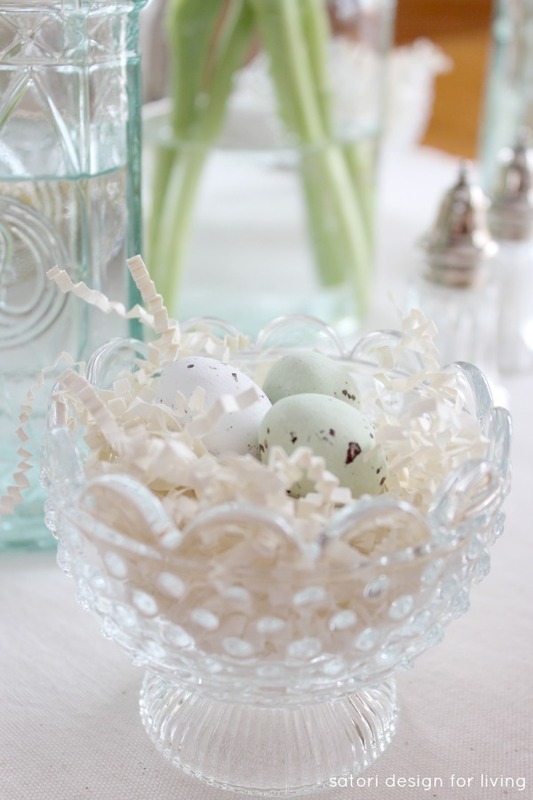 This year’s Easter table is all about embracing simplicity. Putting a table setting together for Easter can be cheap and cheerful. I always like to mix the old with the new in any decorating project to make it interesting and budget-friendly. It’s all about layering and using materials with different textures and tones. I started with a basic runner that I created out of a piece of cotton canvas. Tearing the edges and putting it through the washer and dryer was all it took to get the natural feel I was going for. I set the table with my existing dishes and flatware, and layered some new yellow and white striped linen napkins that I wrapped in a bee-printed cotton ribbon from May Arts. 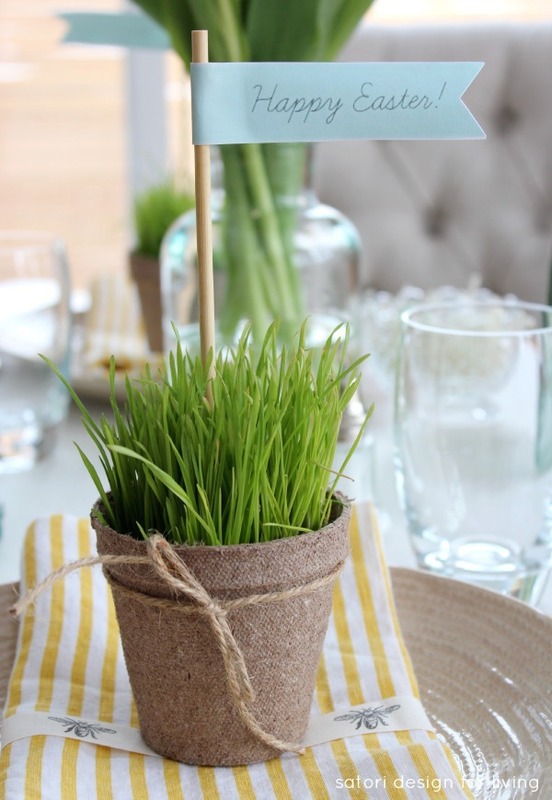 I topped the napkins with simple peat pots that I filled with wheatgrass from the grocery store. Then, I embellished the pots with jute string and a flag I printed out and attached to a chopstick. Here’s where you could mix it up a bit and use them as place card holders instead. I plan on sending these Easter peat pots home with everyone as a small gift. Here’s the Easter printable I created in a soft mint colour that reminds me of spring. Simply click the image to get the PDF (or go HERE), print on cardstock, cut out, fold in half and glue to a chopstick, skewer or popsicle stick. 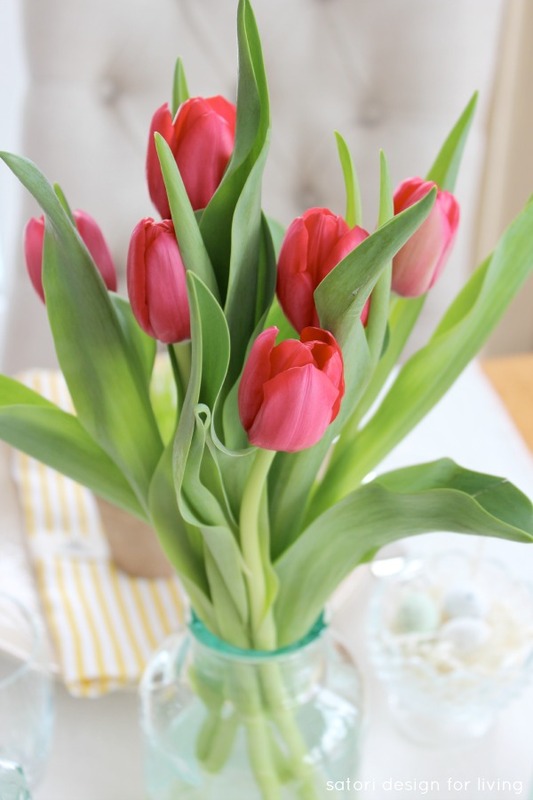 For the flowers, I used my green glass bottles I picked up at a thrift shop and filled them with bright pink tulips for a pop of colour. I love how the light shines through the glass, bringing a bit of sparkle to the table. 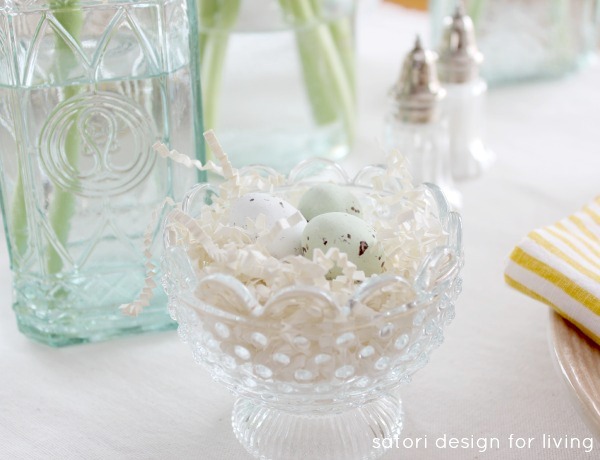 In glass sugar bowls, I placed shredded paper to replicate a bird’s nest and added some chocolate truffles that look like eggs. My husband and son didn’t realize they were edible (chocolate filled with hazelnut cream- yum!) Perhaps we’ll keep that our little secret on Easter Sunday! It’s so nice having this part of our Easter dinner all planned out. Now I just need to decide what’s on the menu! 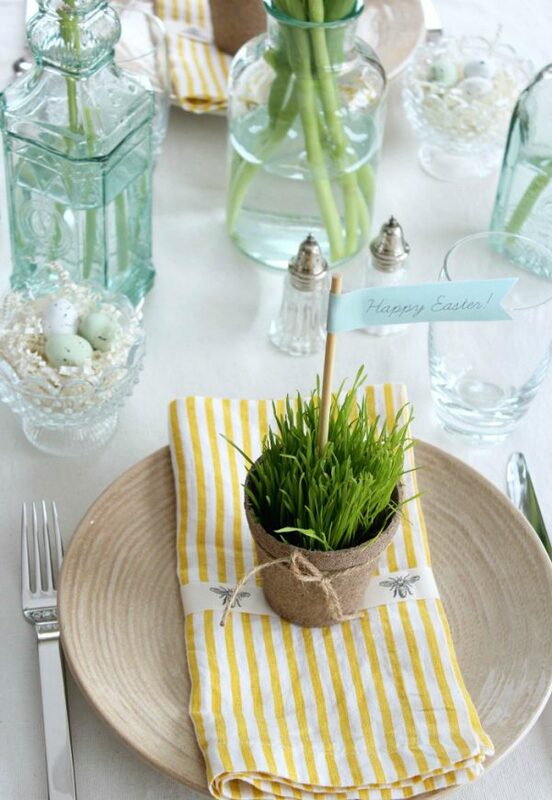 Do you have your Easter tablescape planned out or do you throw it together last minute? 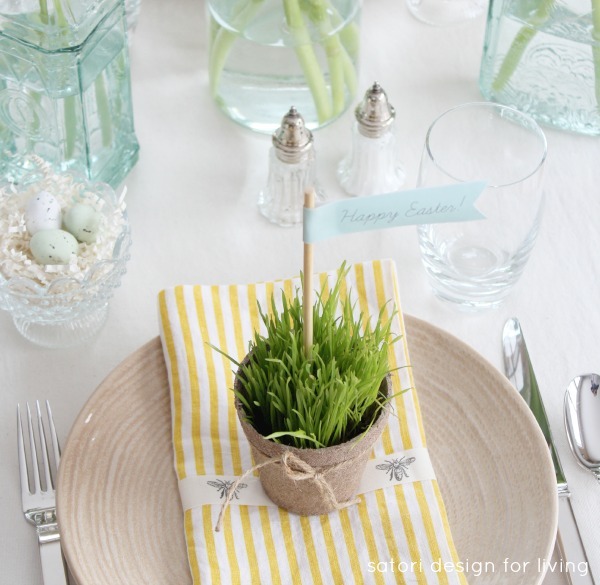 Like this Easter tablescape? Pin it for later! Now for more Easter ideas! Once again, I’ve teamed up with other Canadian home bloggers to share our seasonal projects in a blog hop. 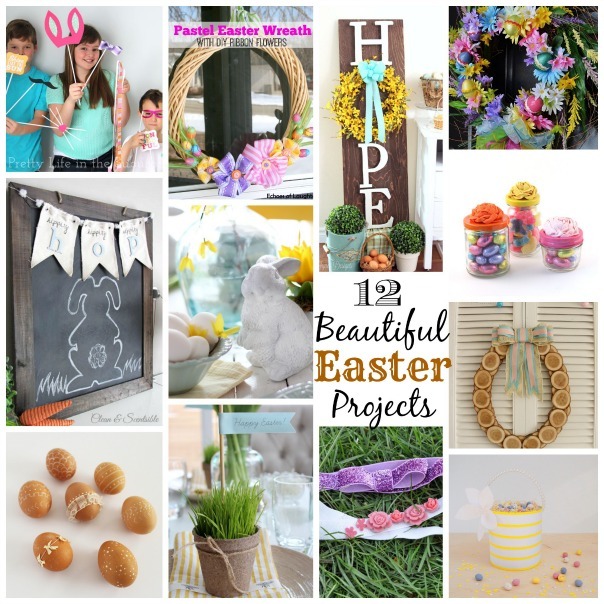 This time you can check out 12 Beautiful Easter Projects that are pretty incredible! 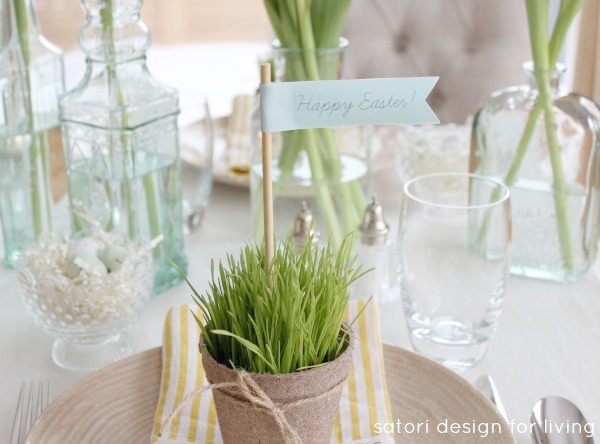 An Easter Table Setting with Peat Pots by Satori Design for Living- that’s me! 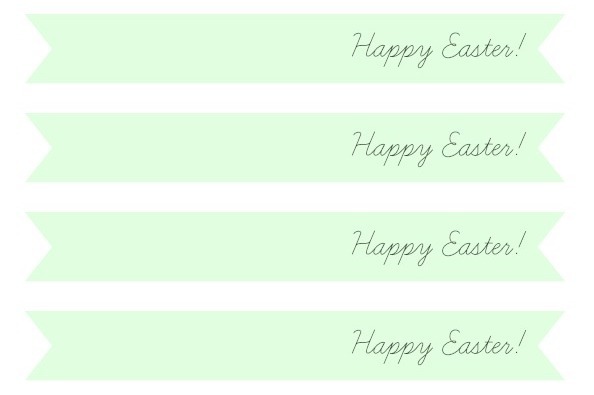 *A big thank you to May Arts for supplying the ribbon for our Easter blog hop projects! Thanks Lucy. That’s too bad about your ribbon. You should see if you can still get it for a future project- it’s super cute! Wow! I love everything! The eggs & nest are my favourite but everything works so well together and looks so fresh and springlike without going cheesy Easter-like. And I must get that bee ribbon!! I’ve always been drawn to bee illustrations and found out a few years ago that my name means ‘honey bee’ in greek….so figures. I love everything about your table setting Shauna! It’s so fresh and springy…I especially love your little grass pots and that bee ribbon is the cutest!! It’s always so fun to see what ribbon everyone chooses. It’s so hard to narrow it down because there are so many great ones! Beautiful ideas Shauna! Simple, soft and lovely! Where did you find those pretty candy eggs (says the nutritionist, lol)? Too funny, Karen. I picked them up at Indigo. I bought them mostly because they’re pretty, but Darren and Hayden HAD to try one, and they are tasty! These are incredibly pretty. Will you please come decorate my house? I love how it screams Spring!! So pretty!!!!! Pinned!! I chuckled when I read that you were going for the ‘cheap and cheerful’ look but you are absolutely right. 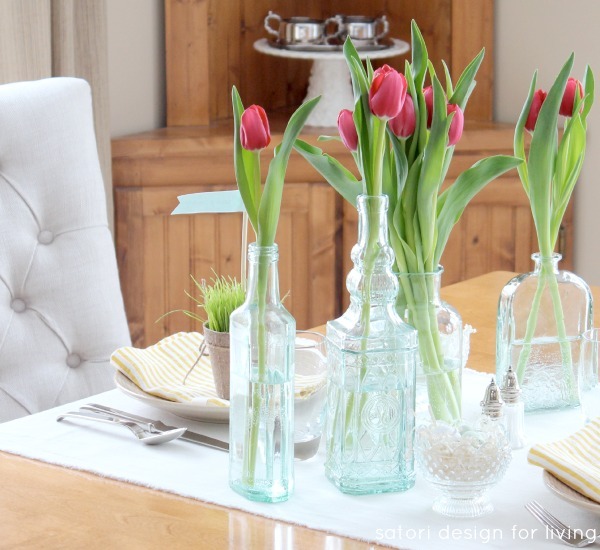 Your tablescape uses the simplest and most inexpensive items but is so stunning and tasteful. I love it. I’m going to check out the organic wheat grass. I love the look it creates. More money left over for the food and drinks (and chocolate)! I’m so pinning! Love the bee embellishment, I’m a sucker for anything “bee” at the moment. Very pretty and fresh! It makes me so excited for Easter. Absolutely beautiful! Makes me wish we had a dining room where I could do this in. Where did you get the pots? I love them! And the ribbon is gorgeous! Thanks Alex! I picked the pots up at the dollar store- they’re so inexpensive. Your table setting is gorgeous, Shauna! It’s so bright and beautiful and elegant… I LOVE it! Your peat place setting is so lovely and fresh – and those truffle eggs? I want them. Lovely table scape Shauna! 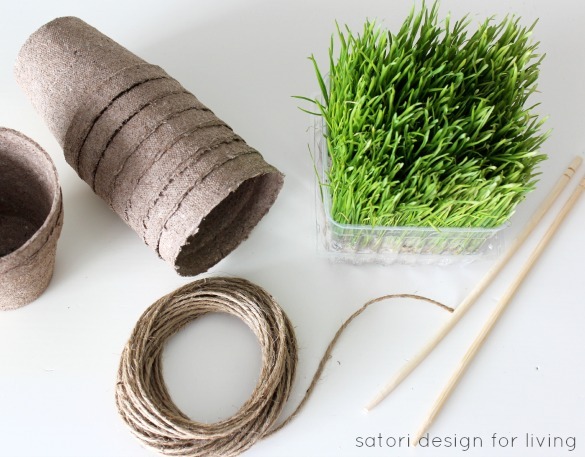 The cat grass is such a fabulous idea! 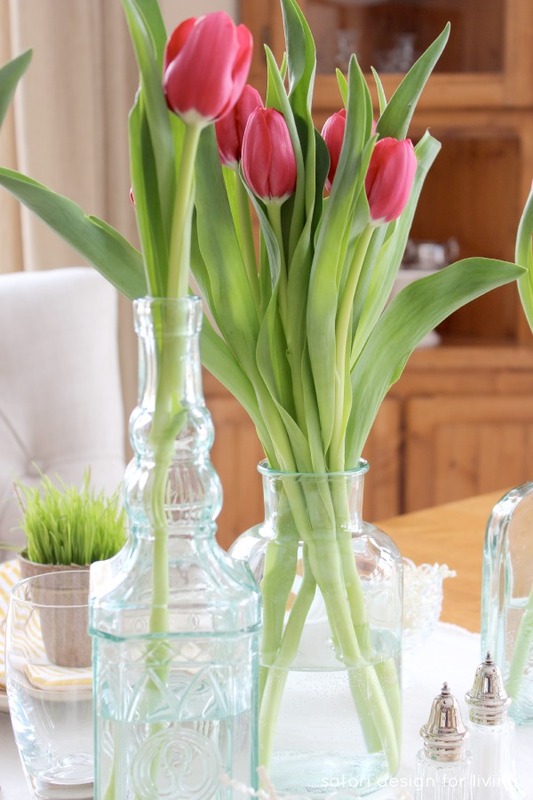 It really brings spring into your space, beautiful! These are absolutely stunning Shauna. I LOVE the simple beauty of the live grass in the peat pots. Absolutely perfect for Easter. Pinned! This is so pretty and so creative. I love it. Stunning! You know us, we love that nature-inspired decor!!! BTW- had a really hard time deciding which photo to pin as they’re all so lovely! Awe, that’s so sweet. Have a great weekend! Thank you, Justine! It was fun to put together. This is so refreshing and simple! Love this gorgeous tablescape!